Make the most of your existing collection of Leica M-mount glass with this Vello Lens Adapter that will allow you to mount these lenses to a Micro Four Thirds camera. Precise construction makes it easy to attach these adapted lenses to your camera and keeps it secure during use. Infinity focus is guaranteed, ensuring that you get proper functionality our of all your optics. Additionally, the adapter is made from a durable zinc alloy and features a matte black finish on the inside to reduce the potential for glare and reflections that can negatively impact image quality. Although the lens will fit physically, autofocus, automatic diaphragm (AE metering), and other functions dependent on communication between camera body and lens will be disrupted by the lens adapter. You will need to focus manually, and to set exposures manually or meter in aperture priority (stop-down) mode. If the lens does not have a manual aperture collar, the aperture will be stopped down to its smallest f/stop. Focusing to infinity is retained. This adapter enables the use of Leica M lenses on Micro Four Thirds cameras, meaning you can now use your existing stable of lenses on your current camera. It is also very secure, holding the lens in place without any wobble sometimes associated with the adapting process. Thanks to precise manufacturing, this adapter is guaranteed to provide infinity focus by placing the lens at the correct distance from the sensor. This allows you to make the most of your lenses and doesn't limit you from shooting distant subjects. Made from a durable zinc alloy, this adapter will withstand many uses and won't wear or break in the way soft brass or cheap plastic would. Also, an internal matte black finish reduces reflections and glare, ensuring your images look sharp and contrasty. Box Dimensions (LxWxH) 3.0 x 3.0 x 0.9"
Leica M Lens to Micro Four Thirds Camera Lens Adapter is rated 3.0 out of 5 by 3. Rated 1 out of 5 by jqnyc from did not work This mount did not lock a 21 mm voightlander either the spring was too weak or the tolerance of the lock-post wasn't properly aligned. I replaced it with a far more expensive piece that worked perfectly. Will this adapter work with the Fuji X series camera? I don't think so. Fuji Cameras such as the XT1 are APS-C sensors and are larger than Micro 4/3 format. The above adaptor should only work with Micro 4/3 formatted cameras, such as Panasonic, Olympus. 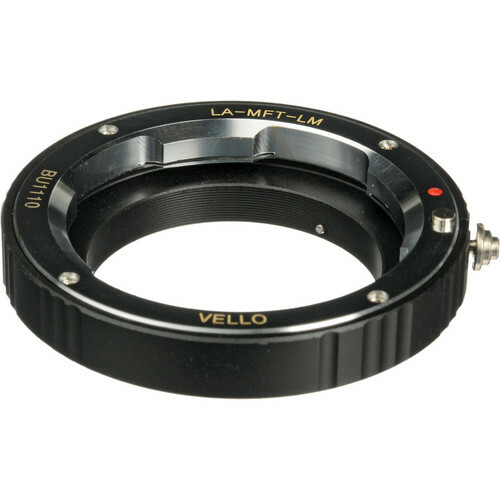 Vello probably makes an adapter for the APS-C cameras, specifically the Fuji X series.